Meet Artwork Archive Artist Debra Joy Groesser. 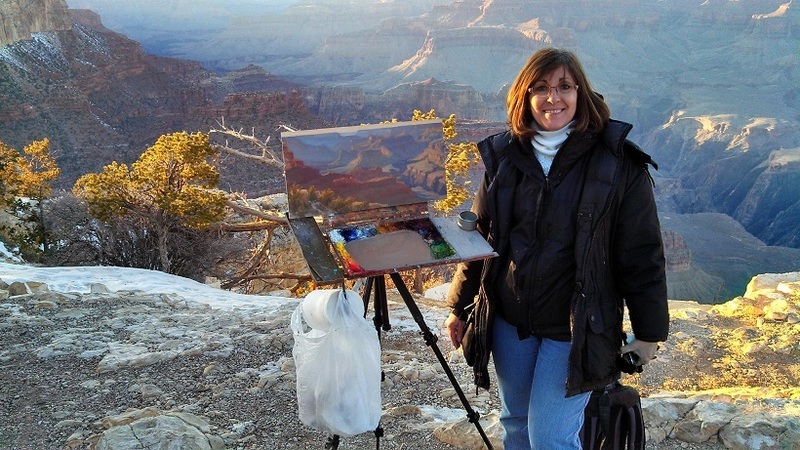 Once a graphic artist, she is now the President and CEO of the American Impressionist Society and a full-time plein air painter. 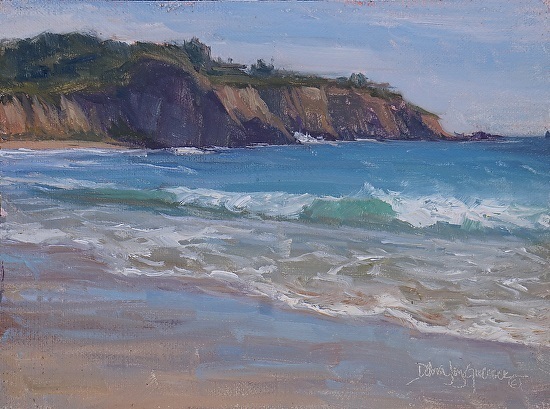 From her Nebraska homeland to the seaside cliffs of California, Debra seeks the life and color that comes with painting on location. 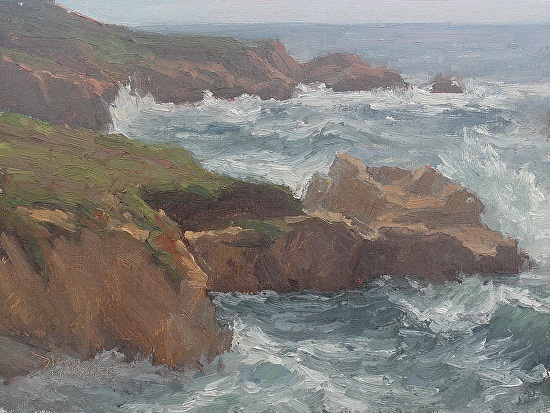 Her passion for plein air and impressionism led to leadership positions in the Plein Air Artists Colorado and the American Impressionist Society. Through her work, she helps artists build their networks, resumes, and careers. We spoke with Debra about how art associations have enriched her career and how she has achieved ongoing support and sales with her educational newsletters. WHAT DREW YOU TO THE SOFT, LIGHT-FOCUSED STYLE OF IMPRESSIONISM AND PLEIN AIR PAINTING? DID YOU ALWAYS PAINT THIS WAY? Impressionism has always been my favorite style of painting. I love the loose brushwork. I did a lot of detailed illustrating earlier in my career, but I couldn’t wait to get back to oil. I did my first plein air workshop in the 90s. It was quite an experience. It was so windy and I was thinking “what in the world am I doing?” We lost canvases, hats, and easels. But despite that, I saw how wonderful plein air painting could be, it opened my eyes. That workshop was held in the Tetons and as I painted those mountains, I saw pinks, purples, oranges, and blues. I shot 16 rolls of film there, but the mountains came out brown and gray. That was not what I saw at all. It really opened my eyes to the colors you actually see and can capture in a painting when you do it from life, out there on location. 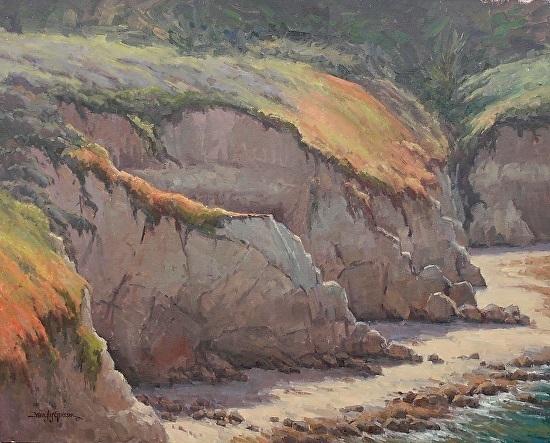 It’s nearly impossible to paint light, shadow and color accurately from a photo without plein air experience. It needs that life you can only capture on location. I did Kevin Macpherson’s plein air workshop in Bermuda. He had everyone bring photos and looked at our portfolios. He told me, “Stop painting from photos and paint from life and we’ll be reading about you someday.” That really stayed with me. Plein air painting has taught me where to push and pull what I see in a photo - where to put the light. In my classes, I always show a piece painted on location and the photo. My students are amazed at the differences. A pink sky and a soft pastel green building both turn to white in a photo. I also love being outside. I just love it! I think “Wow, I’m so lucky my office is wherever I set up my easel.” It’s wonderful to be out in nature, listening to the birds and the wind. Two renderings of Garrapata State Park. 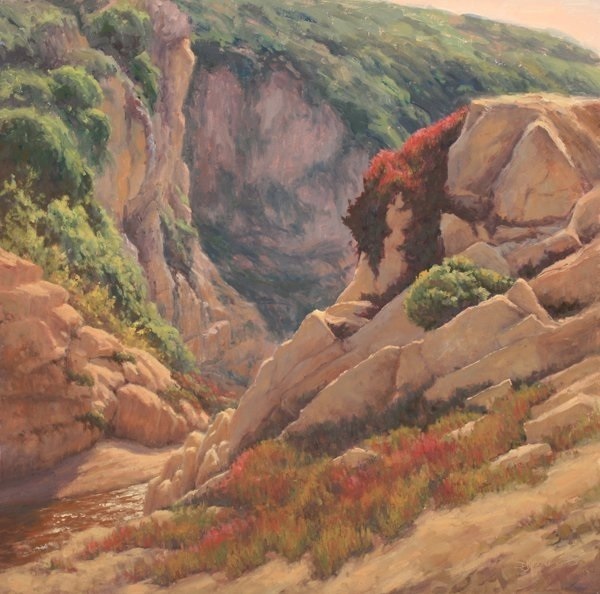 HOW DO YOU DECIDE ON A SUBJECT OR LANDSCAPE, AND WHY DO YOU RETURN TO CERTAIN LANDSCAPES TO PAINT, LIKE GARRAPATA STATE PARK IN CARMEL, CA? What I love about Garrapata is the drama of the coastline no matter what the weather condition. There is always beautiful, dramatic landscape. I love the challenge of painting the ocean. It’s never the same twice, the colors are completely different. The fog will come in and out. And when it’s clear and sunny, the cliffs are golden. I’ve been there in the spring, fall, and summer - it’s always different and always changing. The lighting conditions lend an incredible atmosphere: it’s dramatic and powerful. Light and atmosphere are two things that grab me. It’s all about light, color, and atmosphere. I like to paint things in shadow with really bright accents of sunlight. It’s more about the light than what it is. I was painting at a ranch in Kansas - Kim Casebeer had put together an artist retreat - and the first painting I did was of a piece of equipment with a wicked blade on the back. The way the light was hitting it was really cool. I didn’t know what it was, but I decided to paint it. I showed it to my husband who grew up on a farm. He told me it was a manure spreader - it was so funny. Even a manure spreader can be beautiful through the eyes of an artist. 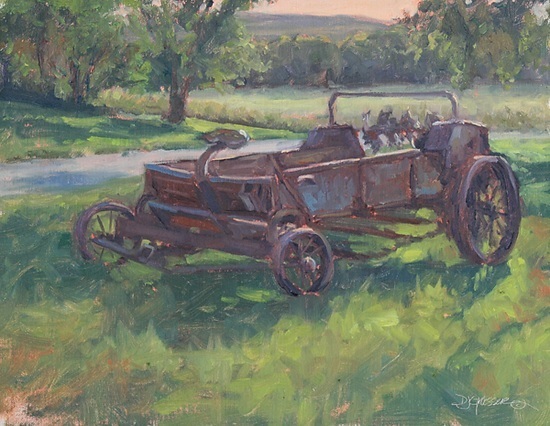 Right: Plein air painting of a manure spreader. WHAT IS UNIQUE ABOUT YOUR CREATIVE PROCESS? I used to use an exclusive palette of five colors and white. A few years ago I did portrait commissions and added back in the earth tones that I’d taken off my palette several years ago. 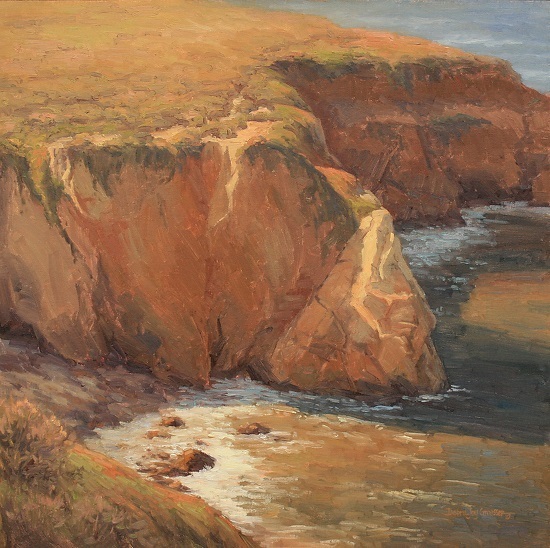 So many flesh tones are similar to colors you see in the rocks and cliffs in CA and other landscapes. I now use warm and cool colors of each primary color. I also use a few neutral grays as shortcuts for graying down paintings. I’ve also added burnt sienna, raw sienna, and yellow ochre. I love what I’m doing with that expanded color palette. I paint on RayMar panels with Claessens number 15 double primed linen. The panels are really easy to transport when traveling - they don’t get punctured or broken. The surface is fairly slick and I love how the paint sits on top of that surface. I can manipulate the paint the way I want it. I use Gamblin paints and I can’t paint without their solvent-free gel. It makes the paint flow so beautifully. Since it has no solvent, you can take it on the plane in your checked luggage. I also always have to have a double cup of tea with me before heading out. I never use an umbrella. I turn my easel into the sun so sometimes what I’m painting is behind me. It’s very windy in Nebraska, and even a bit of wind can create disaster with an umbrella. I have an SUV, and I often use the trunk hatch for shade. It works well whether it’s raining, sleeting, or sunny. One time in Wyoming, it was snowing and sleeting. I was with a friend and we backed our cars together and opened the hatches. We were protected from the elements and were able to keep painting. 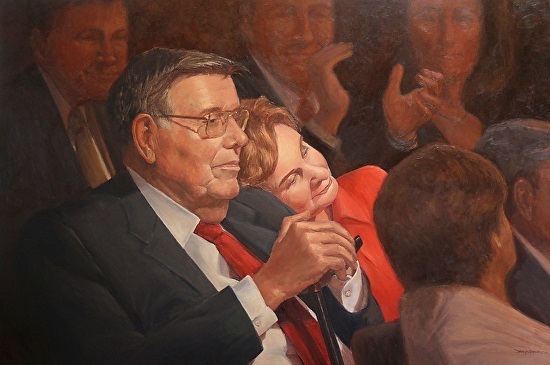 YOU ARE HEAVILY INVOLVED IN ARTIST ASSOCIATIONS AS THE PRESIDENT AND NOW ALSO CEO OF THE AMERICAN IMPRESSIONIST SOCIETY AND A SIGNATURE AND BOARD MEMBER OF PLEIN AIR ARTISTS COLORADO, AMONG OTHERS. HOW DID THIS COME ABOUT AND HOW HAS IT ENRICHED YOUR LIFE AS AN ARTIST? It’s been such a great experience. It’s a lot of work and a big time commitment, but incredibly rewarding. I’ve met wonderful artists from all over the country. The networking is wonderful. I’ve made so many connections and built such great relationships. One of the most rewarding parts is sending out acceptances for juried shows. We can only take a small fraction of the painters. It’s heartwarming to read posts on Facebook and get letters and messages from artists that get in. Many are first timers and are so excited. Those who have made signature membership tell me how AIS has helped their career. We’ve helped so many artists. I’m looking forward to what we can do next. I was named CEO in February and my husband was named as the national treasurer. We’re hoping to implement new things that will offer even more benefits and opportunities for our members. I’m really grateful that every day I get to do what I love. The PAAC folks have been so supportive of this as well. Left: Faith, Strength, and Perserverance. YOU HAVE A BLOG DISCUSSING YOUR WORK AND EXPERIENCES, AS WELL AS A NEWSLETTER. HOW HAVE THESE TOOLS HELPED YOU MARKET YOUR BUSINESS AND CONNECT WITH YOUR BUYERS AND SUPPORTERS? When I post on my blog, I try to make it inspirational. I wrote a post titled Faith, Strength, and Perseverance that speaks to never giving up. I use it to send encouragement to those who didn’t get into the AIS and other juried shows. A friend recently told me how much that post had helped her - I was really touched. What I do more than anything is a monthly newsletter. I sell a painting off every newsletter. I send out a paper newsletter two to three times a year. I have 2000 people on my mailing list. I was in real estate for 10 years and morphed that list into my artist newsletter list. It is a more effective way to stay in contact with collectors, friends and supporters. I include new works, upcoming shows, and a personal letter about what I’ve been up to in my newsletter. I also include an article that’s educational - especially in the paper newsletter. 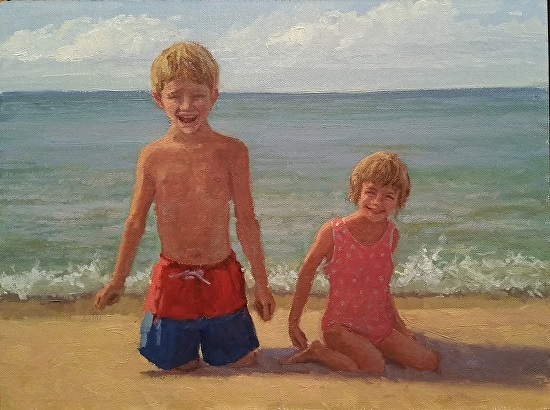 I’ve done step-by-step demos of paintings and how I do portrait commissions. I make sure it’s not all about me. I want to write something that my readers will be interested in. Want to see Debra's work in person? Visit her gallery page.